when I switched from MPS 3.1.2 to 3.1.5 the aspect tabs are gone. I checked the respective option in the settings but "Aspect Tabs" is already set to "Each aspect node in a separate tab, tabs for non-existing aspects". Changing the value of this option does not cause any change to the UI. Is there another configuration detail I have to consider? Additionally it is not possible anymore to show a node in the Explorer (means viewing the abstract-syntax tree). There is no entry in the context menu anymore. This is quite odd behaviour, indeed. The tabs work correctly for me, however. Do the other "tab" configuration options take effect? Are you not on MacOS and JDK 1.8? 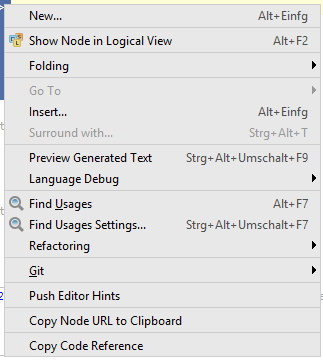 The Node Explorer can be invoked through the Alt + F12 keyboard shortcut or from the context menu. What entries do you have left in the context menu? thank you once again for your quick reply! I use the JDK 1.7.0u51. Which one do you use? Maybe I should try the same version... The other "tab" configuration options also take no visible effect. I also have problems with the Migration Assistant. Is it possible that a former migration caused inconsistencies which now result in this odd behavior? If yes, is there any way to "clean up" the languages? We do not support JDK 1.7 in general, although it rarely caused problems on Windows. You could try 1.6, which was the only supported JDK in MPS 3.1. Could you also try on a fresh new project, please? This would eliminate the suspicion regarding previous migration. To cure a failed migration, I'm afraid you have to do a revert in VCS. Ok, I switched to Java 1.6 but this didn't help. A fresh project showed the same behavior. So I downloaded and installed MPS a second time - and now it works. I have no idea what went wrong the first time but it must be related to the download step because I already re-installed MPS but with the same downloaded archive. I'm glad that things now work.